Our love affair with John and Jennifer Churchman, authors of the wildly popular Sweet Pea & Friends: The Sheepover, continues to grow strong. 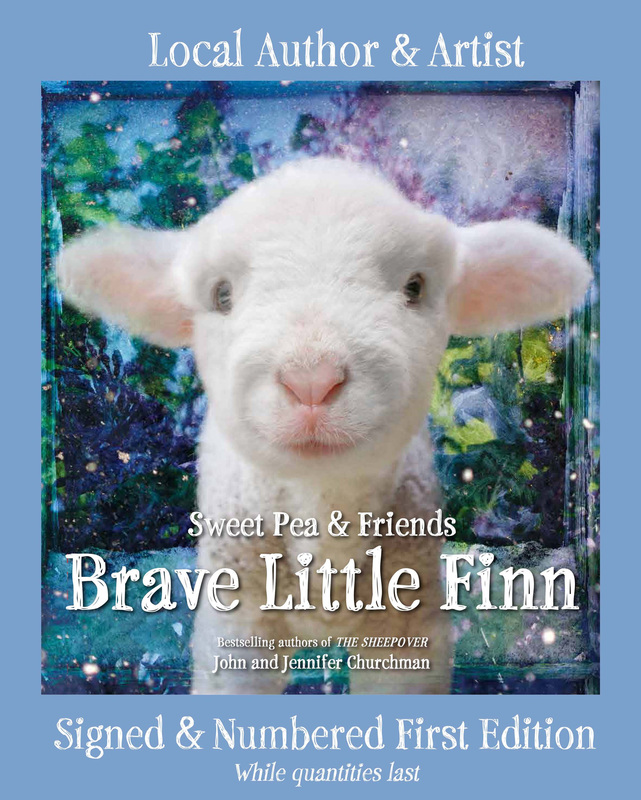 John and Jen hatched a plan with their publisher, Hachette, to give Vermont independent bookstore a real break at being the only stores to pre-sell their second book, Brave Little Finn, by offering 1,000 numbered books well before the October 4th release date. All participating stores got 50 books, with the possibility of getting more if sales warranted. The Churchmans announced the deal on Friday around noon. By 12:01 my phone was literally ringing off the hook. By 2 pm I was calling John, literally begging for more books as I had blown past my 50. Selling this book has been so much fun. That so many people were so invested in this book is lovely. But lovelier still was that almost every person had a story they had to share about their story with The Sheepover. Something about this book series has really captured people. And my God, look at the cover of the new book, and you’ll understand that the cute factor is huge with these books. And yes, that’s a real lamb. But the heartwarming stories kept being shared. A sick grandchild who felt better after getting The Sheepover, friends laughing and sharing their experiences with the first book, and one woman whose story had me tearing up a little. “I have just to share this with you,” began one woman from Virginia. “After my husband passed last year, I just had to hold Finn. So I drove up to the Churchmans’ farm to see him. Of course by the time I got there, he weighed 35 pounds, but he did rest his head on my shoulder. I just have to have this book.” I heard stories like this all weekend as orders from all over the country streamed in. One thing that I found particularly amusing was the way credit card numbers were read to me on the phone. Most people read their credit numbers in groups of four. But not all people read them as single numbers. I had versions of 5524 that ran the gamut of being read singly (yay), to being read fifty five twenty four (not so much yay), and then one person really had my dyslexic brain scrambling as she read her card as: five thousand five hundred and twenty four. There was no way I was able to input that in the credit card machine. I just started chuckling and explained that I’m dyslexic and could she please just read each number. We laughed when the card was finally approved. What the Churchmans have done is create huge buzz for a book that will likely be the bestselling book for almost every bookstore in Vermont. But more importantly, by giving Vermont indies the first crack, it is truly a gift. As a bookseller, I’m so grateful that the Churchmans are Vermonters who understand that it was the indies, especially the Vermont indies, who made the first book such a huge hit, and they are returning the favor. And once the numbered editions are gone they offer special books with hoof prints. So it’s a win-win for all. This entry was posted in Uncategorized on April 18, 2016 by Josie Leavitt. I must say the book cover is so eye catching! Saw this book at the BBF offices when I met with them on behalf of IPNE,org!